Brought together to undertake the challenge of mooting an efficient food security policy for five regions across the planet, public policy and management students from around the world participated in the Naspaa -Batten Student Simulation Competition that was held on 25th February 2017. The team that included students from the Universidad de Los Andes was named as winner. The competition included components such as challenging the students' ability to work in a team. 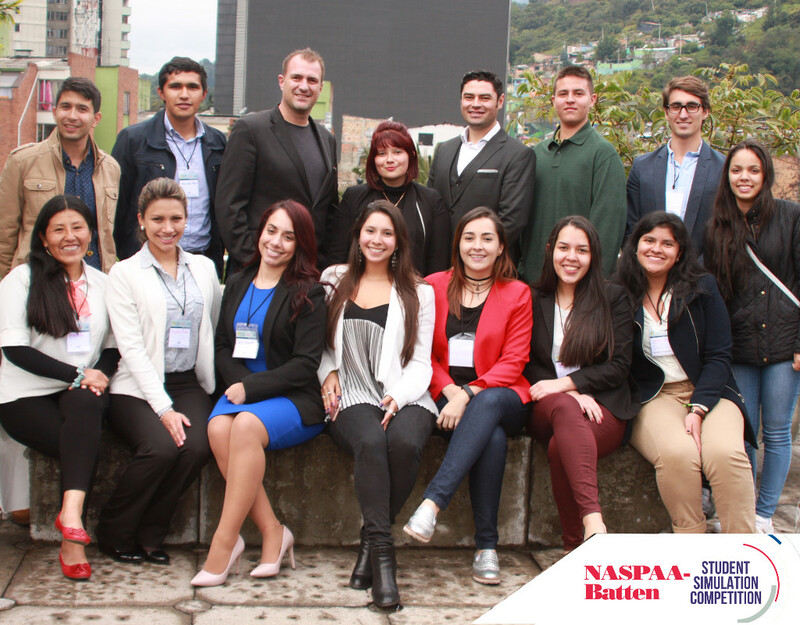 It was held simultaneously at National Association of Schools of Public Affairs and Administration (Naspaa) accredited universities in eight cities around the world: Maastricht, New York, Washington D.C., Indianapolis, Phoenix, Seattle, Beijing, and Bogotá where the event was hosted by the School of Government at the Universidad de los Andes. The competition is known as ‘simulation day’, and the students are organized into teams known as ‘worlds'. According to the rules of the game, the members of each world have to undertake activities very similar to what would have to be done in real life situations. For example, competitors had to assume the position of directors of fictional non-government organizations and official organizations operating in areas such as health, the environment, and agriculture. They engaged with their political responsibility to design effective programs that would eradicate hunger in South East Asia, East and West Africa, and South America by 2030 in order to meet the requirements of the United Nations Sustainable Development Goals. Each team participated in the simulation using software designed by the Center for Leadership Simulation and Gaming at the Frank Batten School of Leadership and Public Policy in Virginia. This tool made it easy for students to find the regions that needed help, relevant data for these regions, the initiatives that would be developed on site, and the cost of implementing these initiatives. Diego Lucumí, director of the Master´s program in Public Health, as well as Mónica Pachón and Mauricio Velásquez who acted as local judges, explained to the students that they had four rounds to plan, discuss, and present their proposal to address the problem. The judges graded the players' performances, their capacity for analysis and discussion, and the approach taken by the final proposal that was presented to the other teams and the judges. Finally, each world's proposal was presented to the 'super judges' at Naspaa headquarters in Virginia, United States. Sebastián Bitar, associate professor at the School of Government noted that the students “demonstrated their ability to extensively and creatively resolve problems, and they showed that solutions do not always have to be technical.” The winning team emphasized their ability to understand that the answer to global problems should be adapted to a regional level. Angélica Pachón Bueno, a Masters student on the Public Health program, wrote the following on her experience, “Having the opportunity to participate in an event of such class, and being given such rewarding opinions from public policy makers makes me feel proud to be part of this university”. The winning team was comprised of Angélica Pachón, Damaris Rozo, Fabián David Camacho, Juan Camilo Villalobos, Juan Pablo Espinosa, Maritza Zela, Sandra Manotas, and Susana Yabrudy from the Universidad de los Andes; Carlos Valadez and Francisco Esquivel from the Universidad de Guanajuato; Jineth Araujo and Sergio Peláez from the Universidad del Rosario; Juliana Díaz from the Universidad EAFIT, Laura Mora from the Universidad Externado; and Sasha Zapata from the Universidad Roger Williams. Diego Lucumí believes that the Naspaa simulation is an exercise that provides very important lessons: ones relating to analytical, communication, and strategic skills as well as leadership and the need for students to work in teams. It is a challenging situation during which it is possible to take advantage of what has already been learned. It also allows the work at the School of Government to become visible as well as that of the Universidad de los Andes in general: other ways and methodologies of class-based learning are applied, mechanisms are studied to approach the global and regional reality, and it allows us to learn from other schools throughout the world.